How Many Attack Submarines Does the United States Need? The U.S. Navy may face a critical shortfall in Virginia-class boats in the next decade. 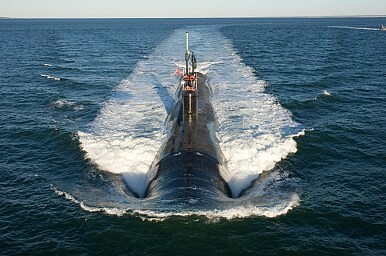 The U.S. Navy is looking into the possibility of building three instead of two new nuclear-powered Virginia-class attack submarines (SSN-774) per year, military.com reports. The reason is simple: with older Los-Angeles-class fast-attack submarines (built between 1972 and 1996) retiring at a faster pace than Virginia subs are added, the U.S. Navy will face a shortfall in the number of active vessels in the near future. This projected deficit is not news and was already predicted by analysts as far back as 1995, given the U.S. Navy’s current requirement of deploying an average of 10 nuclear-powered attack submarines (SSNs) on a day-to-day basis. Given this deployment schedule, the navy must maintain a fleet of 48 SSNs over the next few decades. However, beginning in 2025, active SSNs will gradually drop below that number and eventually bottom out at 41 in 2029, which implies a shortfall of seven boats that year. Based on the U.S. Navy’s current 30-year SSN procurement plan, this gap will exist for 12 years until 2041, when the number of SSNs will finally be back at 48. “We are going to drop below the minimum requirement of 48 (attack submarines) even with the two per year build rate – so we’ve got to sustain that two-per year build rate and figure out ways to work through that trough, or a low point. Unfortunately, we will go down to 41 SSNs at one point,” Rear Adm. Joseph Tofalo, Director of Undersea Warfare, stated. The biggest issue is finding the man power pool in an economy that is also coming back. That is probably the biggest challenge. During the decade of the 80s this country built three SSNs (attack submarines) and one SSBN (ballistic missile submarine) every year for about a decade. This country can do amazing things when challenged. As of now, the U.S. Navy fields 55 SSNs including 41 Los-Angeles-class, three Seawolf-class, and 11 Virginia-class boats, according to the Congressional Research Service. There are talks about extending the life cycle of some SSNs by ten or more years (between 2002 to 2008, the U.S. Navy already turned four of its oldest Ohio-class SSBNs into SSGNs), or more interestingly, revising the U.S. Navy’s operational requirements. After the navy succeeded in removing about $400 million from the cost of each submarine, the price per vessel is now at about $2 billion. However, the navy is now planning to add up to 28 additional Tomahawk cruise missiles to each Virginia-class sub by installing the so called Virginia Payload Module (see: “US Subs Getting Fire Power Boost”). SSNs are multipurpose vessels and can perform a variety of missions including intelligence collection, covert insertion of special operations forces, land strikes, as well as anti-submarine and anti-surface warfare. Of course, the larger question behind the issue of the number of deployed SSNs is what the genuine operational requirements of the United States Navy in the first half of the 21st century should be in times of fiscal austerity. The USS Indiana was commissioned on September 29. Latest US Nuclear-Powered Attack Submarine Completes Initial Sea TrialsUS Navy’s Newest Fast-Attack Submarine CommissionedContract Awarded for US Submarines’ Expanded Launch CapacityUS to Commission New Fast-Attack Submarine in SeptemberWhat Can the Middle Ages Teach Us About US Naval Strategy?